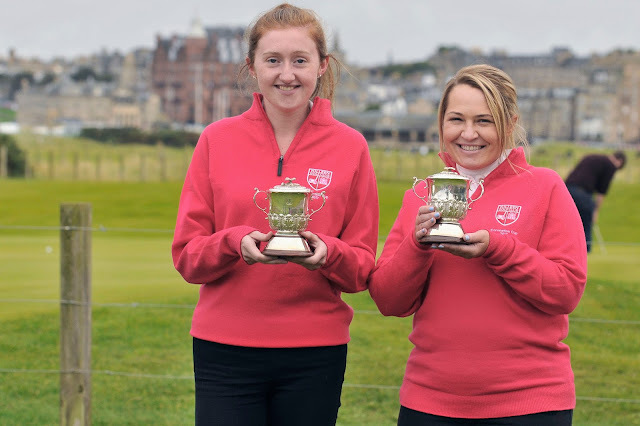 An Irish partnership, Siobhan Behan and Lorraine Walsh, members of Killeen Golf Club, Co Kildare, were narrow winners of the Coronation Foursomes Grand Final over the Eden Course, St Andrews today. Siobhan (handicap 8) and Lorraine (handicap 23) scored 41 Stableford net points. They gained 19pt before the turn and 22pt in a sparkling inward half. They had a gross score of 84 strokes. That second nine holes won it for Behan and Walsh as they were trailing Hayston's Susan Thom (handicap 18) and Joyce Woollon) (19), and Moor Hall's Julie Burton (6) and Claire Howells (6) after nine holes, both pairs having 20pts to their credit at the turn. Scots Thom and Woollon finished second with 40pt (20-20) and Burton and Howells third with 39pt (20-19). The winners receive a place in next year's Ricoh Women's British Open pro-am at Royal Lytham and St Annes Golf Club. The 16 pairs who contested the grand final had come through local and regional finals to play over a par-73 Eden Course of 5,450yd. 40 Susan Thom (18) and Joyce Woollon (19) (Hayston GC). 39 Julia Burton (6) and Claire Howells (6) (Moor Hall GC). 36 Heather Knox (18) and Carolyn Lines (24) (Aspley Guise and Woburn Sands GC). 35 Linda Spence (26) and Alison Turnbull (26) (Elie and Earlsferry GC). 34 Victoria Brooks (24) and Caroline Tremlett (13) (Coed Y Mwstwr GC); Paula Bayliss (26) and Ellena Slater (16) (Tudor Park GC). 33 Barbara Beedham (16) and Maria Venn (36) (Wenvoe Castle GC); Anne Allan (26) and Lindsay Gray (23) (Auchterarder GC). 31 Helen Durrant (28) and Dianne Kingsbury (18) (Parkstone GC). 29 Sharon Symons (20) and Rosie Williams (24) (Brookmans Park GC). 26 Sara Bland (25) and Jacqueline Parker (12) (Wensum Valley GC). 21 Roisin Corry (18) and Ann McKenna (12) (Aughnacloy GC).